The Sun is the most important planet of all; others may confer gifts and blessing in plenty; however, if there is no Sun, the world is waste, desolate and lifeless. All have the soul within. The soul is of its nature light, just like the Sun; the Sun sheds is own light upon all life and is the giver of night and day, strength and character, along with regulation of organs in the human form. The Sun is superior among all the planets, and he becomes pleased with whoever reveres him consistently. Among the planets, he is God incarnate in solar form. Those who regularly and devotedly remember the Sun lose all their worries, disease and poverty, for unwavering worship of the Sun destroys all obstructions and fulfils all cherished desires. Everything originates from the Sun for he is the soul of all. He is the king of the sky; the ruler of all that falls between the earth and the celestial regions. Lord of the east, the Sun rules both Sunday and the constellation Leo. He is the Cause of the Day, the Teriffic Fiery-Rayed One, the Significator of World Bliss. He is called the Shiner, the Enlivener, the Generator, the Life-Giver, the Life-Maker, the Day-Causer and He-whose-rays-are-piercingly-hot. The haritas, the Sun’s green horses, are the seven solar rays, which are the seven Vedic metres: Gayatri, Trishrup, Anustrup, Jagati, Pankti, Bhrhati and Ushnik. There is no reckoning of time without the Sun and without time, there can be no poetry, no seasons, no rhythm in the world. A well-placed Sun gives intelligence, perception, and strength of will and character. It affords endurance, stamina, vitality, positive spirit, direction, courage, conviction, confidence, leadership, independence and straightforwardness. Without a well placed Sun, whatever we may do or accomplish in life will not be ours and will not give us inner strength or peace. A poorly placed Sun gives lack of intelligence, limited perception, weakness of will and character. It creates lack of endurance, low vitality, melancholy, fear, dependency or servitude, deviousness or dishonesty. The Sun – when malefic in the birth chart – creates pride, arrogance, and tyranny. When it is too strong, it creates many of the same problems as Mars. It can give a deceptive charisma and a manipulative personality. When the Sun is strong we outshine everyone else – for good or ill – depending on whether its disposition is benefic or malefic. A weak but spiritually disposed Sun makes us receptive, self-effacing and eager to do good. But we lack confidence and come under the rule of other people. We seek to sacrifice ourselves but do not know what to give ourselves over to. The Sun rules the heart, the organ of circulation and vitality, and a weak Sun may give problems with that organ. Inwardly the heart is the seat of intelligence that regulates the life, breath, aspiration and perception. The Sun in the chart shows who we really are in our hearts. It is karakamsha, significator of the soul in the chart in addition to Atmakaraka (the soul principle). In this regard, placement of the Sun is important (bhava, house) and the yogas the Sun forms with other planets is also of importance. You will not fail to notice the discrepancy of the yoga being described as ever-existing and the statement that it was lost! Of course the statement was not made without thought. The indestructible is here spoken of as having been destroyed! It is called indestructible or Avyaya for two reasons. Its origin is the Veda, which is free from decline. This yoga on account of passage of time, neglect and disuse, was forgotten. That is to say, it disappeared, it was lost to view, it declined. The statement does not mean anything more. Bringing it into life means, bringing it once again into use, not creating it ab initio! ‘Lost to view’ is the sense in which the word ‘destroyed’ is used in a general way. That is how you have to interpret it, for the Lord will never devise a thing that will suffer ‘destruction’. The reference to Surya also merits consideration. 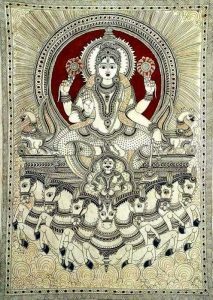 The people of Bharath (India) are intimately associated with the Sun-god. The heroes of Bharath (India), the Kshathriyas (warrior caste), are from the beginning attached to Surya; even for ordinary men and women, Surya is so highly sacred that He has been raised to the status of the great Guru. The sacred scriptures and legends of India have not assigned a status of similar glory to any one else. It is a unique position that Surya occupies. Why, for the whole world, the sun is the visible manifestation of the Lord. And the sun is the source of time. Surya is the father of time as the Sastras declare. The sun limits and regulates the number of years each one lives; the sun diminishes every day a fraction of the allotted span. So the sun is the supreme arbiter, the maker of man’s destiny. Whether one wills or not, every deed of his is performed under His auspices (that of the Sun) and dedicated to Him. Above all, consider the service the Sun does to this world! That is within the daily experience of all; every one is witness to that. The Sun is the source of all life, plant and animal, upon this planet. Without His rays, it will be a desolate waste. He draws up into the sky the waters of seas and lakes, and from the clouds He pours rain on the crops. He is ever the Dharmadevatha (the God giving righteousness, right action), scattering His rays equally on all. 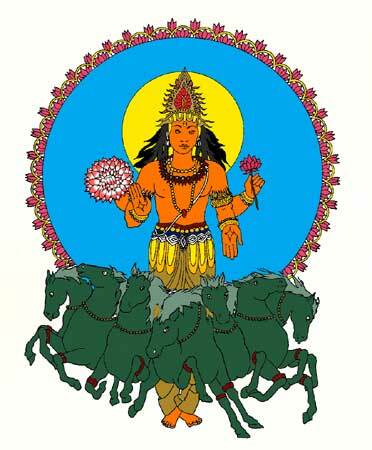 Surya is the great Thyagi (penitent) for unequalled renunciation. He is the great Yogi; without a second’s thought of His own glory or of rest. He performs His duty without thought of reward. He is humble and steady in work. The service He does is something no one else can fulfil. The happiness He contributes is something no one else can confer. But He has no pretensions to pride. He moves above unconcerned with the consequences of His energising mission of service. Imagine the patience with which the Sun puts up with all that extreme heat, for the sake of the world and of humanity. It is He who keeps the human body warm and comfortable. This material body is so full of energy and intelligence on account of the solar energy that it imbibes. If the sun is idle for a moment, the world will be consumed in flames. Instead, He is fostering the world. He feels it as His mission, His purpose, and not as His service. It is only in the karma that is your very nature that you can have fortitude; if it is just an assumed duty, you will find it difficult to put up with the troubles and travails. Assumed Karma is called A-sahaja Karma, and Karma that is the expression of one’s genuine self is Sahajakarma. Now Sahajakarma will sit light and A-sahajakarma will induce conceit, or the feeling ‘I am the doer,’ so it will result in exhaustion or elation, disgust or pride. Think of this one point: when a man is well, no one will inquire about his health. But if he is stricken with illness or sorrow, every one will inquire why and bombard him with anxious queries. Why this anxiety? Man is fundamentally happy and healthy. His nature is joy; that is his Sahajaswabhava. So when he is happy and healthy, no one is surprised or worried. But grief and sorrow are strange to his make-up; they are the result of a delusion that has overwhelmed his nature. So people get worried and they set about finding out how he got so deluded. The Sun is teaching us that when one is oneself, there will be no exhaustion or elation, no disgust or pride. The task of Surya is not something imposed from outside and taken up under compulsion. That is why it is performed systematically, and smoothly. He is also exhorting mankind to use the time that He creates and allots, fully and fruitfully; not merely for living comfortably and safely, but for living a moral and elevating life, worthy of the destiny that is man’s. Now you can realise why the Gita was first taught by the Lord to the Sun. He is the great Karmayogi, the great Nishkama Karma Yogi (the one who undertakes action without seeking the results). Krishna is now teaching this indestructible Gita sastra to Arjuna, the representative of man at the crossroads; and He chose him for he has the same excellences, is it not? Reflect on that for a moment. If Arjuna was not a vessel endowed with such virtues and splendour, Krishna would not have decided to use him as the recipient of the Gita. The Lord will not give gifts to the undeserving. Arjuna had the dualities that were needed for receiving the teaching and he was chosen. The Sun is Lord Surya Narayana. Gayatri Mantra is worship of the Sun; anyone who chants the Gayatri Mantra obtains clear discrimination. 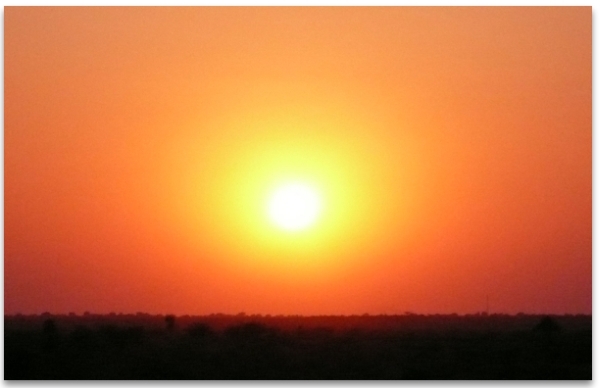 Those who do Surya Namaskar (Salutations to the Sun) gain health, strength and awareness. Those who listen to, chant or read Aditya Hrudayam The Hymn of the Sun, (Consolation of Lord Rama) conquer all their foes (inner and outer) as surely as Lord Rama slew Ravanna in battle.